I am happy to announce that I will be publishing my first book, The Bare Bones: An Unconventional Evolutionary History of the Skeleton with Indiana University Press. This has been a labor of love over the past 6 years, and it is great to see it finally coming to fruition. What can we learn about the evolution of jaws from a pair of scissors? How does the flight of a tennis ball help explain how fish overcome drag? What do a spacesuit and a chicken egg have in common? Highlighting the fascinating twists and turns of evolution across more than 540 million years, paleobiologist Matthew Bonnan uses everyday objects to explain the emergence and adaptation of the vertebrate skeleton. . .What can camera lenses tell us about the eyes of marine reptiles? How does understanding what prevents a coffee mug from spilling help us understand the posture of dinosaurs?. . .The answers to these and other intriguing questions illustrate how scientists have pieced together the history of vertebrates from their bare bones. With its engaging and informative text, plus more than 200 illustrative diagrams created by the author, The Bare Bones is an unconventional and reader-friendly introduction to the skeleton as an evolving machine. The metronome of speed. In a musical metronome, the speed of the ticking pendulum is controlled by a weight on its end. In this case, a slow tempo results from placing the metronome’s weight far away from the pivot, whereas placing the weight close to the pivot allows it to tick faster. 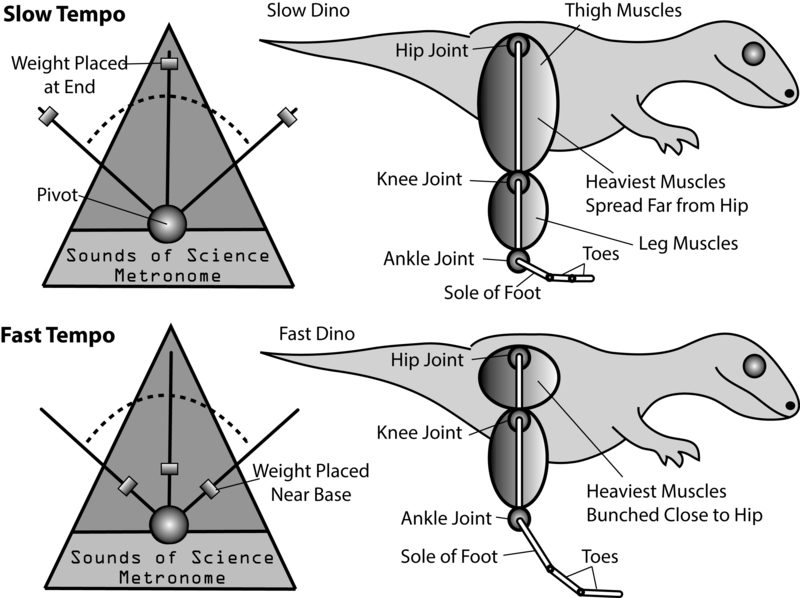 Similarly, a hypothetical dinosaur with a long femur and short leg and foot segments would be relatively slow because the heavy muscles that move the thigh are spread far from the hip joint, much like a metronome weight displaced far from the pivot. In contrast, a hypothetical dinosaur with a short femur and long leg and foot segments would be relatively fast because now the heavy thigh muscles are bunched near the hip joint, much like a metronome weight placed close to the pivot. Why did I write it? I was inspired to write this book when I began teaching my own vertebrate evolution and paleontology course for undergraduate students. What I found was that many of these students were fascinated by vertebrate evolution, but that few, if any, went on to careers in museums and academe. Instead, many of my students were future teachers, doctors, veterinarians, and perhaps even politicians. There are many excellent books available on vertebrate paleontology, many of which I consulted in writing this book, but their focus tends to be strongly taxonomic and linearly chronological: who is who, who is related to whom, and in what order do we find them. However, the books that had truly inspired me to become a paleontologist were those that tackled the issue of functional morphology and paleobiology: what does the skeleton tell us about how the animal moved, fed, and behaved? This is the type of questions that motivated me as a student to learn about vertebrate history. During my undergraduate days, I stumbled upon a small book called The Evolution of Vertebrate Design by the late paleontologist Leonard Radinsky that would truly influence my approach to writing. Radinsky took a complex subject like vertebrate paleontology and, using cartoons and brief but informative language, distilled the essence of our evolutionary story into a format that was friendly and approachable. In fact, I initially used his book in my vertebrate paleontology and evolution courses because it served as a jumping-off point for exploring the rich tapestry of vertebrate life past and present. Given that Radinsky passed away in 1985, his beautiful book was never updated. Despite its appeal to my students, with each passing year the stack of articles I was assigning to supplement the understandably dated material was becoming larger than the book itself! Simultaneously, as my research developed into understanding the evolution of dinosaur locomotion, I was beginning to question why I had never paid more attention to classical mechanics in my physics courses. When I took physics, I found the course to be absolutely dull and dry. However, if you can understand the way that the machines and tools that surround us in our daily lives work the way that they do, you can approach the skeleton the same way. And then I thought, what if I tried to write a book about the evolution of the vertebrate skeleton as if I were someone trying to teach my younger self about classical mechanics and physics? Using Radinsky’s book as an inspiration and launch point, I began writing the book now being published: what I hope is a friendly but somewhat unconventional introduction and exploration of the history of the skeleton, using machine metaphors, for those who want to learn but do not (yet) have the chops for anatomy. Why should you buy this book? Among many reasons, the best is probably that I have included a figure of a cat overturning a Prius. Just a brief announcement that the NAMS Research Symposium, which features research by NAMS students with faculty, is this Friday, April 17 in the C/D Atrium on the Main Campus of Stockton University. Students will be at their posters between 3-5PM. You can see the research our students are doing by downloading the NAMS Research Symposium Abstract Booklet 2015.